I thought they may come back with a “Sorry can’t help you” reply. I braced myself for the disappointment because I wanted to work with Howards Storage on this post. There are two main reasons for this: Firstly, I’m a fan of Howards Storage and their organisational systems; and secondly, I (really) needed the help. 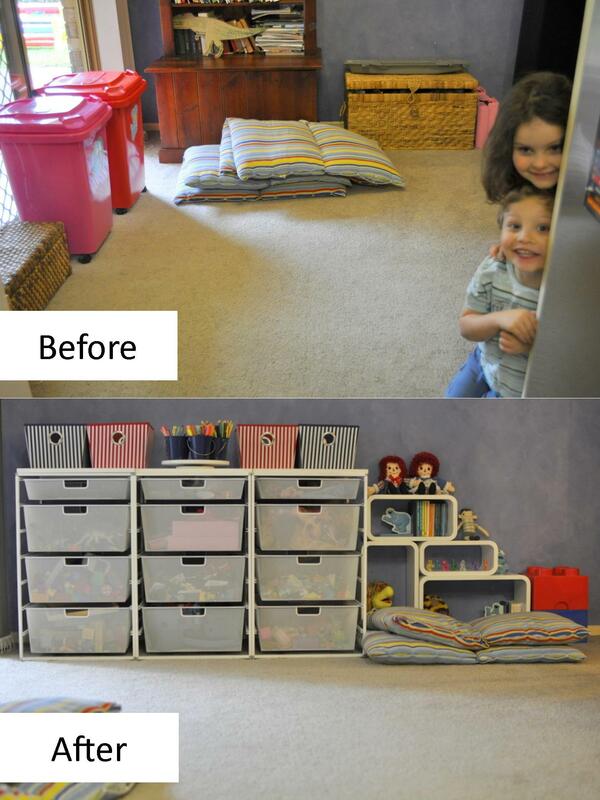 Help with the playroom, or more accurately, the absence of a playroom. The children: There are four of them. My eldest doesn’t play with toys anymore (expect Lego); she’s twelve, so it’s just the other three that use the toys (aged 10,7,6). Our house: The three children’s rooms are small; I can fit only 1 bed/bunk and dresser so I don’t keep toys in the rooms, and we don’t have a spare room we can use as a play area. 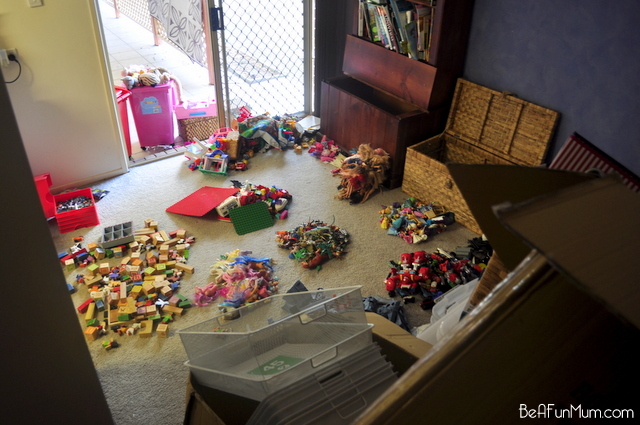 Position: The designated play area is a walk-through space where I place mismatched boxes along the walls. 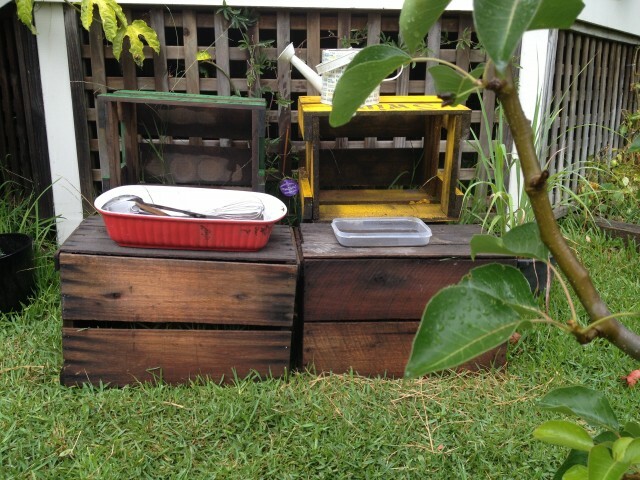 Aesthetics: It’s a high traffic area of the house, and it doesn’t look appealing. Play is important to me, and I wanted to invest some effort in this space to make it inspiring for the children. 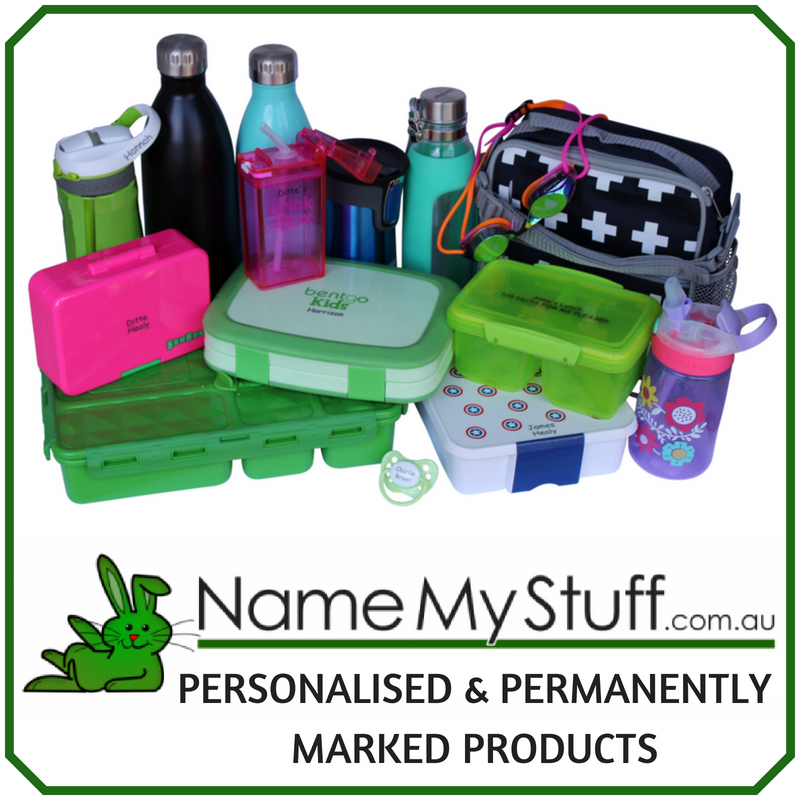 Products: The woven boxes haven’t stood up to the regular rigours of childhood play; the bins are great but the kids tend to tip everything out to find things at the bottom so pack up is a nightmare; and some of the toys are rarely played with now. 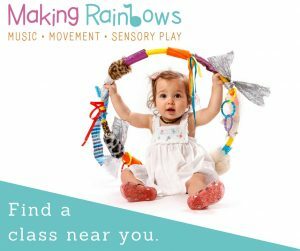 I enjoy the kids playing in this open space because, although I don’t often get down and play with them, I do feel involved in their play. 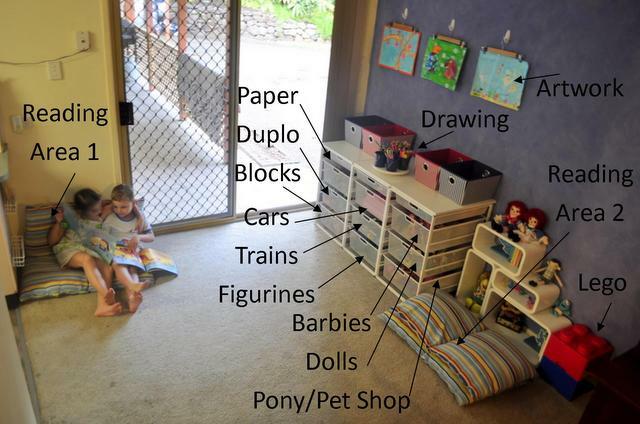 This room is central to key areas in the house so play is a natural and integral part of family life. I like that. I reorganise the toys about twice a year, and when I’m in the process of it, I remind myself that it gets (much) worse before it gets better. I’m ruthless and pull EVERYTHING out. 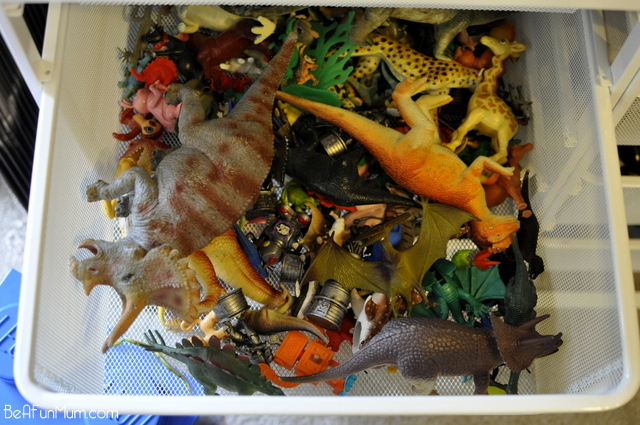 After pulling the toys out, I sort them into groups; the kids helped me with this. 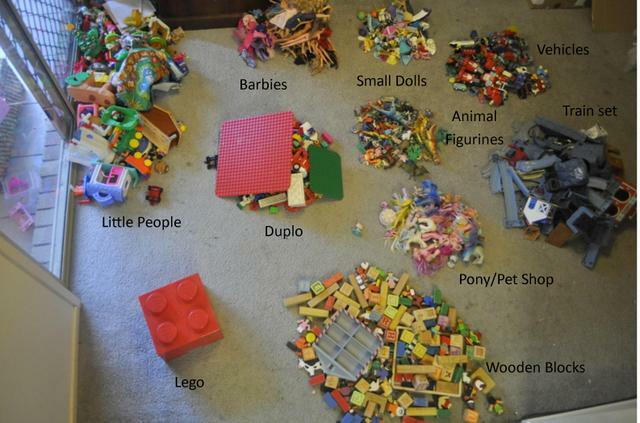 I always feel grateful that my children have so many toy options to play with when I see how many toys they have. 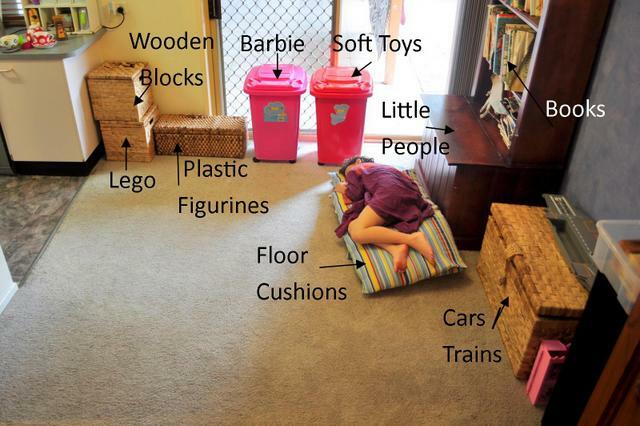 This is pretty much all the toys in our house, besides stuffed toys which are now kept in the bedrooms. Prioritise toys most played with. Give away items the children don’t need or use. 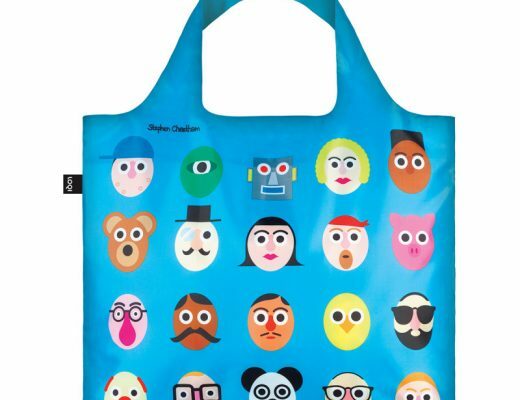 Store some toys and rotate to keep things fresh. 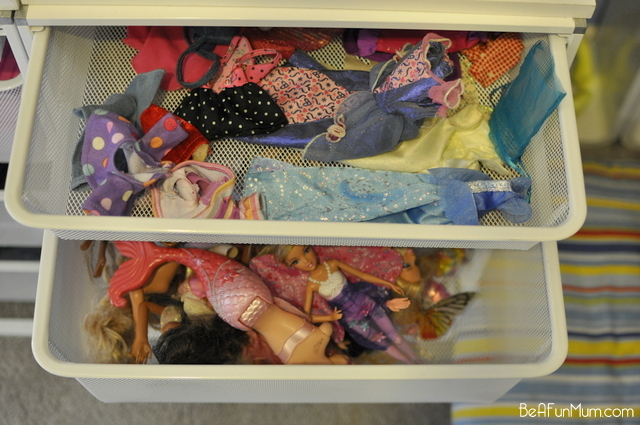 I stored toys (like the Little People toys) in an Easi-store Underbed Box on wheels. 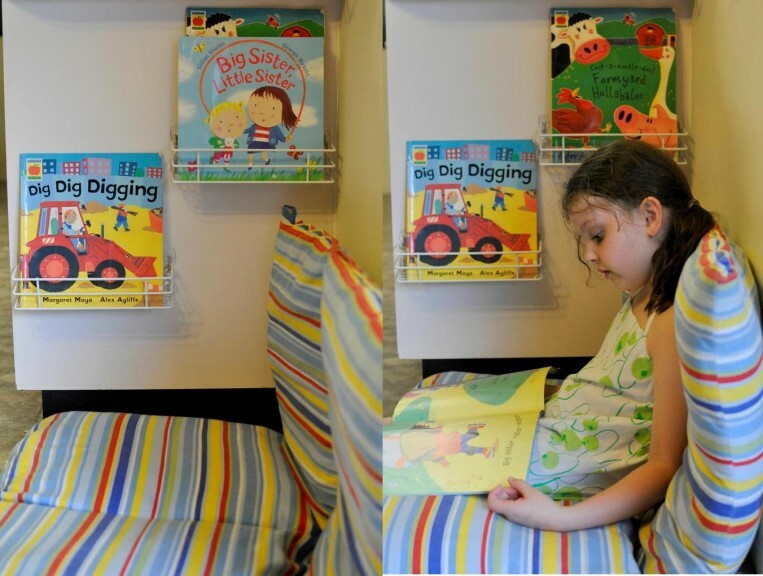 Spice racks allow for easy access to favourite books in this reading corner. Books can be easily rotated each week. 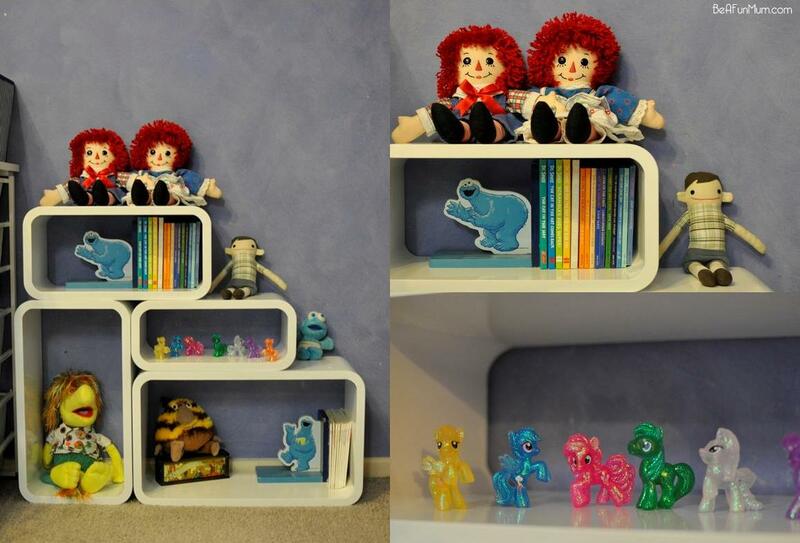 Dekorkubes cubes are versatile stackable, hangable shelves. 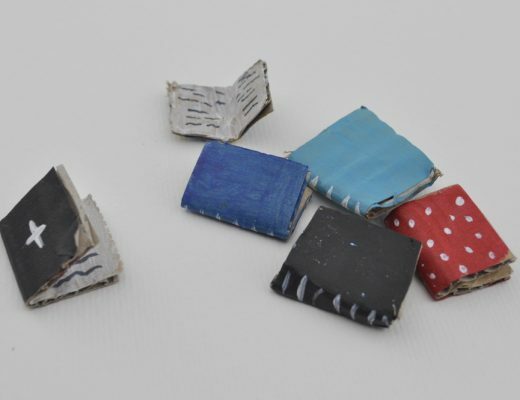 They are perfect for storing small books and cute knick-knacks. I use them as a mini bookshelf storing small books and story-book related toys, like my favourite childhood story books, Grug by Ted Prior. The toys are stored in a Swedish designed elfa system (there’s a ten year guarantee with this product). 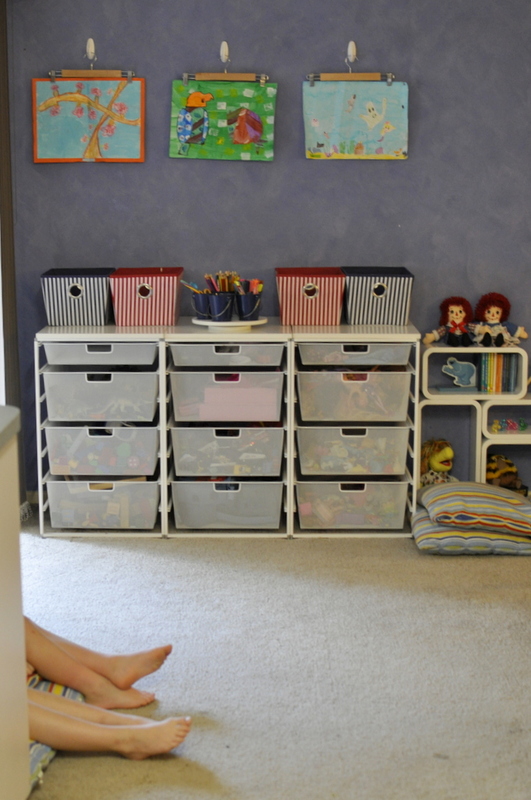 The mesh baskets are huge and sturdy and the children can easily find what they are looking for and clean-up is simple and quick. 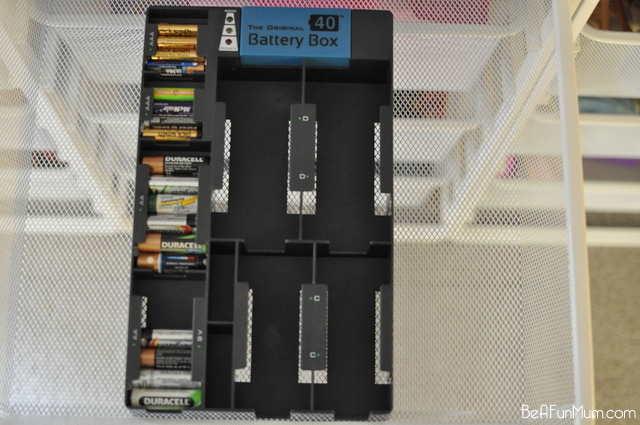 One of the top draws holds a Battery Box that stores different sized batteries and there’s a tester too, so you can see which batteries are charged. Simple. Clever. 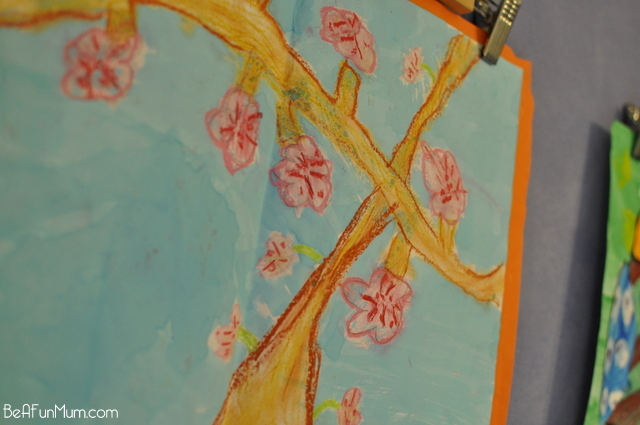 The children produce a lot of artwork, and the fridge just isn’t big enough! I think this is my favourite part of the play room, because the idea is simple and I love seeing the children’s masterpieces on the walls. 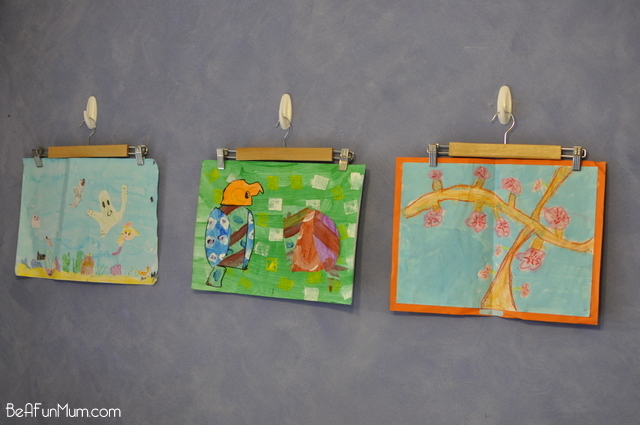 To hang the artwork, I used three Command Hooks and skirt hangers. Now I can display and change artwork as the children do it and it gives this space a special and varied feel. 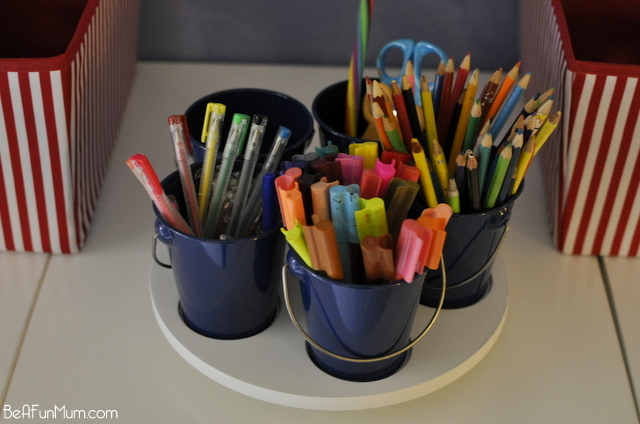 My children draw most days, and the mini bucket turntable is perfect for all our drawing supplies. 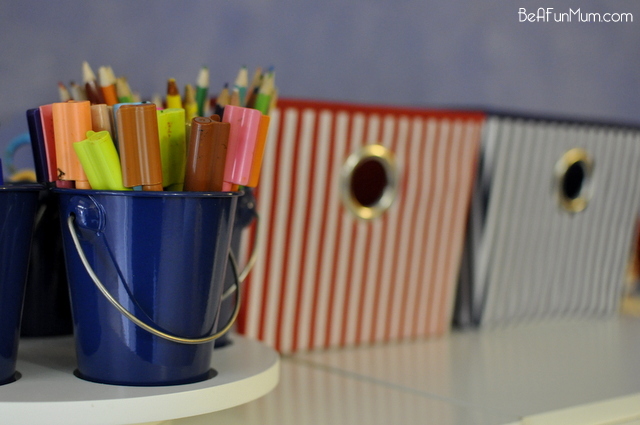 When the kids want to draw, they can grab a bucket, find a comfortable place, and go for it. Other craft supplies are stored on the bench top in navy & red striped totes. 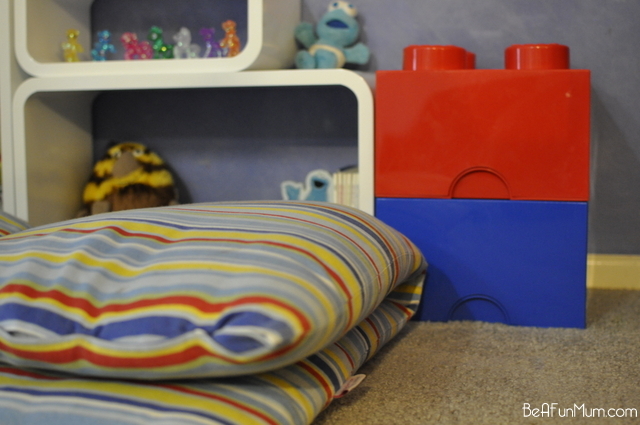 The Lego storage bricks add a splash of colour to the room. The kids think keeping Lego INSIDE big Lego bricks is awesome. I am beyond thrilled with the result. How good does it look!? I know I’m gushing but I can’t help it. So happy. Already, I can tell the changes make a difference in how the children play, and pack up. It will be interesting to see how it goes after the novelty has worn off, so I’ll do another post in a couple of weeks. If you’re stuck with an area, take a picture to Howards Storage, and see what they can do for you! I’m overwhelmed with the cleverness (and simplicity) of the systems and grateful for the tailored advice. This is the new view from my kitchen. Ah, the happiness of it. It looks good. It feels good. So good! Do you have a challenging area in your home? 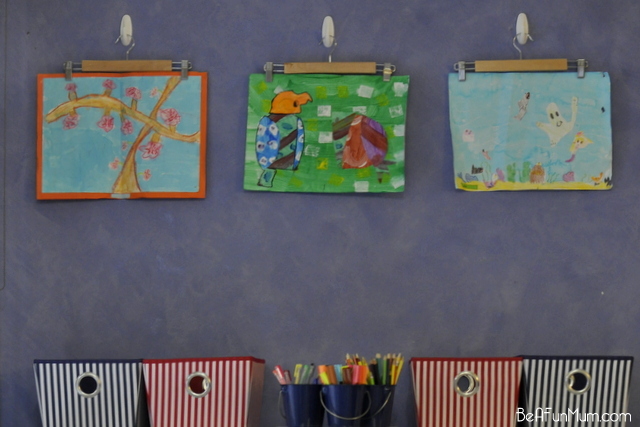 I love the idea to use command hooks to display children’s artwork! I’m always looking for different ideas on ho to display my sons work! Thank you!